A clutch of national parks created by royal decree in 1993 protect Cambodia’s countless natural treasures and perfectly showcase this little country’s wild splendour. 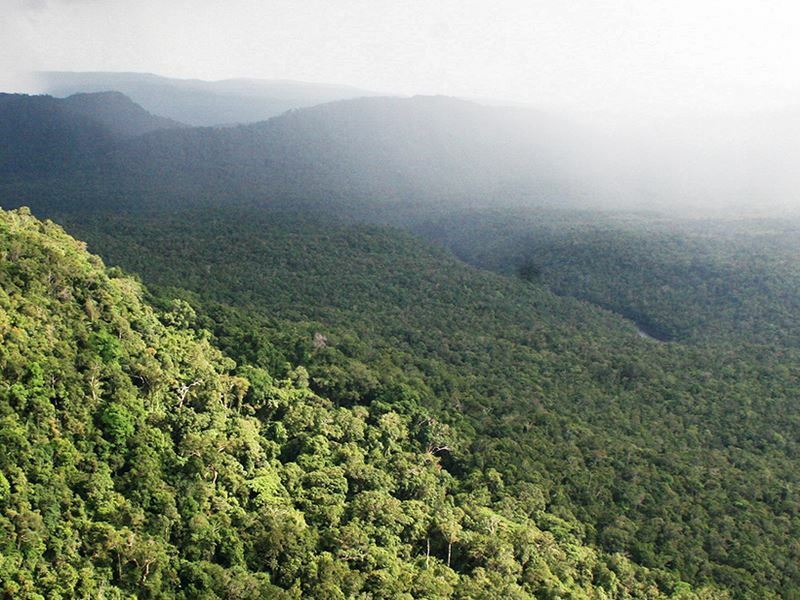 Vast undisturbed rainforests, river valleys, coastal mangroves and misty peaks harbour pockets of rare south-east Asian wildlife – and indeed two of Cambodia’s national parks are also ASEAN (Association of South-East Asian Nations) Heritage Reserves, designed to protect the region’s flora and fauna. With many of them bordering Cambodia’s evocatively-named Cardamom Mountains, the parks add up to seven wild wonders, boasting everything from temple-topped mountains and ancient stone-carved riverbeds to eerie colonial hill stations and endangered species such as sunbears, slow loris and even tigers. Well-marked trails and community-based eco-tourism projects mean travellers can explore some of these protected areas independently, while others offer guided tours, boat trips and camping expeditions into the wilderness with expert rangers. Each has a park office or information centre, and entrance fees are rarely more than one US dollar. Although all of the parks are virtually adventure playgrounds that will appeal to lovers of the great outdoors, each and every one is different and many contain man-made marvels and heritage sites too. Whether you are looking for a simple serene escape from the city or an exciting expedition into uncharted territory, here we look at the highlights of each. 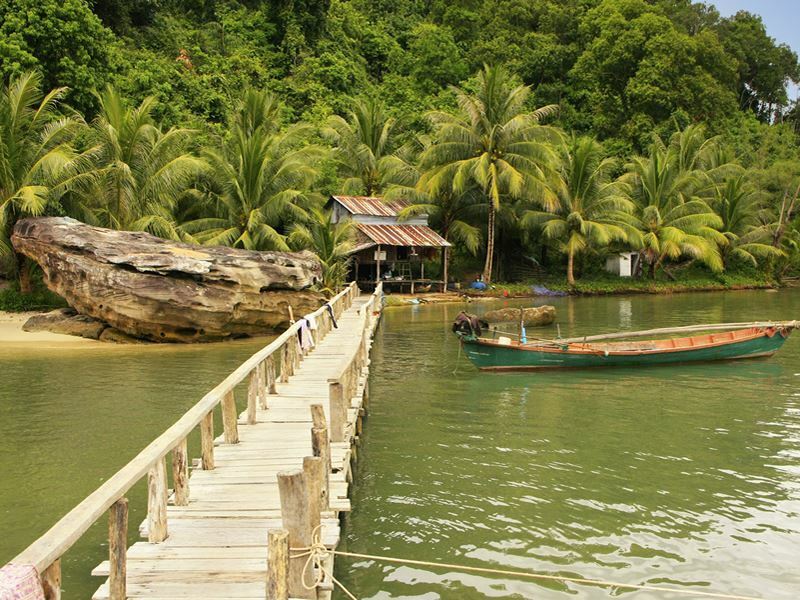 Beyond Cambodia’s Cardamom Mountains, a sloping peninsula of dense rainforest and mangroves juts forth into the Gulf of Thailand, forming part of the Koh Kong Conservation Corridor. More than 25 years ago it was turned into Cambodia’s biggest national park, Botum Sakor, offering a remote haven for countless rare creatures including eight types of endangered mammal. A hotspot for wildlife enthusiasts, its unique ecosystem includes Asian elephants, slow loris, pileated gibbons, otters, sambar deer, civets and fishing cats. Recent evidence suggests that its thickly-forested interior is also one of the last refuges of the Indochinese tiger, and could harbour sun and moon bears too. The park can be accessed by road or boat, and once there, rangers can guide visitors around for a small fee. 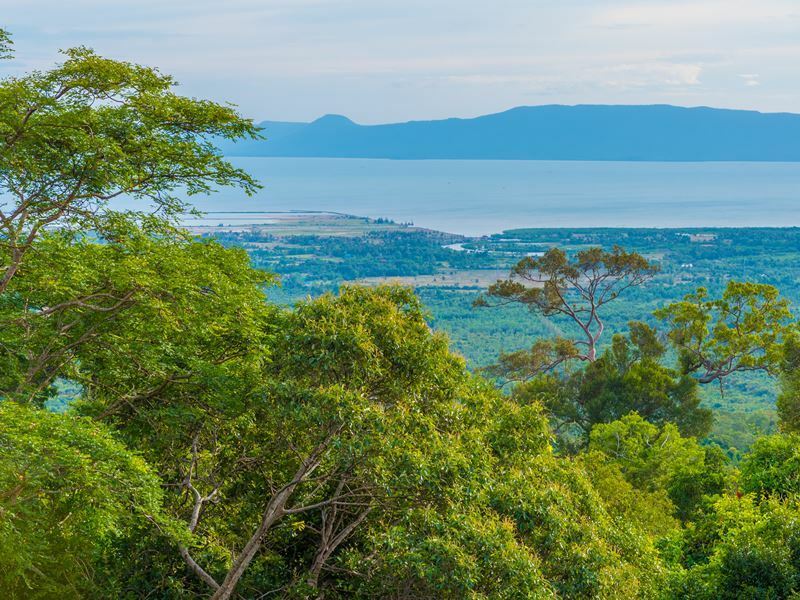 Kep National Park is Cambodia’s most southern tract of protected land, enclosing high verdant hills with stirring views over the ocean to the paradise island of Phu Quoc and the marine reserve beyond. Criss-crossed by walking tracks, it’s heaven for hikers, but there are easy circuits for less-experienced walkers too. From the park’s main five-mile circuit you can access a myriad of trails. Routes are well-marked in bright yellow and pass pagodas and ranches, penetrate deep into the jungle, and lead to jaw-dropping viewpoints. For fans of dramatic panoramas, the jaunt up the Stairway to Heaven to Sunset Rock is well worth the effort. Within the park, the Led Zep Cafe offers an appetising menu and refreshments, while at the foot of the reserve, the town of Kep itself has a famous fresh crab market and beachside eateries. The town’s former French colonial villas are being turned into pretty hotels and guesthouses, including Kep Lodge and Veranda Natural Resort, making it an appealing place to stop overnight. A pocket of paradise, Ream National Park is a nature lover’s dream. Hugging a beautiful section of coastline in the south of Cambodia, close to the popular beach town of Sihanoukville, it protects more than 80 square miles of land and sea separated by an idyllic ribbon of white sand. From terraced waterfalls and lush valleys to mangroves and reefs, the park’s diverse habitats support a rich range of life. Palm-tufted hills are bisected by the Prek Teuk Sap River running south to the sea and feeding an area of low-lying wetlands, estuaries and bays that make the ideal home for dugongs, cranes and pelicans. Its coastal waters are home to dolphins and turtles, while rhesus monkeys and mouse deer dwell on the plains. Offshore, the bounds of the park extend to no less than 21 islets including Cambodia’s second largest island Koh Rong. Here, the surface of the water conceals a vibrant underwater world that can be discovered on a local boat trip. The park can be accessed on a day tour from Sihanoukville and the ranger’s station is right by the entrance. For visitors the most convenient place to stay in the area is the Sun and Moon Gulf Resort, but it’s also possible to board a boat to one of the park’s idyllic islands where simple beach bungalow accommodation is on offer. One of two ASEAN Heritage Parks in Cambodia, Bokor has history as well as striking scarps, cascades and fairytale landscapes. Set in the cool highlands of the south-eastern Cardamom Mountains, its chief attraction is an atmospheric abandoned hill station built by French colonialists in the early twentieth century. Named after its highest peak Phnom Bokor, the reserve is also called Preah Monivong National Park after Cambodian King Sisowath Monivong who frequented the area and ordered the a Buddhist temple to be built there in 1924. Reached by train or road, the peaceful coastal town of Kampot, known for its salt and pepper farms, sits on the edge of the park and makes a good base to explore the area. Tours into the park include a sunset river cruise to watch the fireflies. The park’s popularity with visitors seeking respite from the tropic heat has also led to the opening of the luxury Thansur Bokor Highland Resort set within the park’s bounds. 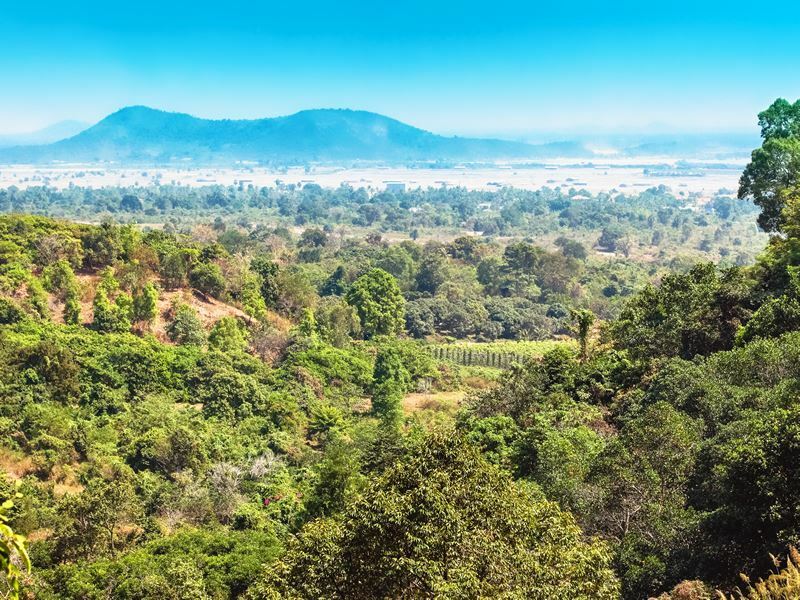 A remote corner of north-eastern Cambodia’s dense jungles and rock-strewn grasslands, Virachey has never been fully explored, making it an enticing proposition for intrepid travellers. It’s one of south-east Asia’s ecological sanctuaries – an ASEAN Heritage Park bordering on Vietnam and Laos with a strong focus on conserving its natural riches. Here travellers can get off the beaten track to discover isolated areas of wild rivers and untouched forest, rarely-seen creatures, waterfalls and mountains. From its eco-tourism office in Banlung, the park organises day-long river cruises, as well as guided treks of varying durations into the interior where you can hear and likely see troops of gibbons and spot elusive creatures such as clouded leopards and sun bears. In fact the park is said to contain all kinds of fantastic animals from elephants and black bears to slow loris and possibly even tigers. Indigenous hill tribes also make their homes along the park’s border and run community-based eco-tourism projects for visitors. Pretty Kirirom National Park is laced with legends. Translated as Happy Mountain, the park is associated with the myth of two princely brothers represented by the twin hills of Vorvong and Sorvong and it was once a royal retreat for King Sihanouk who built a palace there. In south-west Cambodia, bordering the Cardamom Mountains, it was the first national park ever created in the country with foot trails weaving through the elevated pine forests to serene lakes and enchanting waterfalls. The park is fairly easily accessible via National Highway 4 between capital Phnom Penh and the southern beach town of Sihanoukville. Inside the park there’s an information centre, and a village running a local ecotourism program. Visitors can also stay overnight in the area at the serene Kirirom Mountain Lodge. 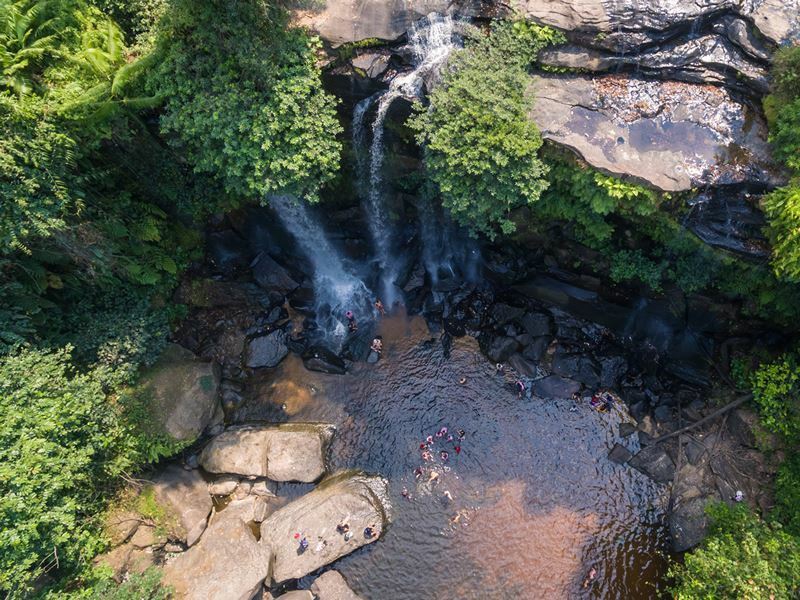 Perhaps Cambodia’s most alluring national park, Phnom Kulen is blessed with both ancient archaeological marvels and fantastical scenery, plus it’s only a short hop north of Siem Reap and the famous Angkor Wat complex. 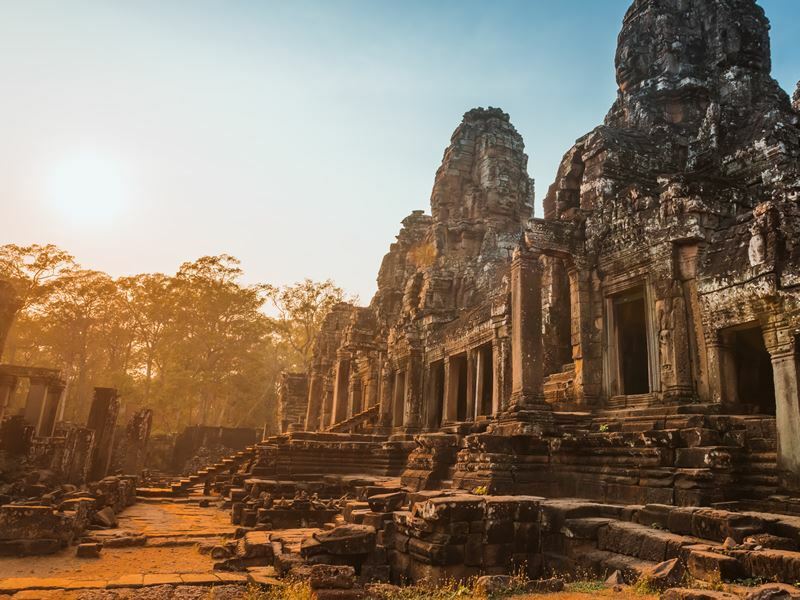 Named after Cambodia’s most sacred mountain that crowns the park, it’s a place of pilgrimage for local Buddhists who flock to its giant reclining Buddha, carved from sandstone and housed inside Wat Preah Ang Thom. On the mountain’s forested slopes, the park also contains a hidden marvel that’s not-to-be-missed – the River of a Thousand Lingas – a spellbinding stretch of stream with a stone riverbed carved in patterns and reliefs by the ancient Angkorians. Nearby the time-worn animal sculptures of Srah Damrei loom through the trees, and the ruins of the Prasat Rong Chen terraced temple beg to be explored. Waterfalls cascade down into deep plunge pools providing the perfect place to cool off after a hike through the steamy jungle. Visitors can find more man-made marvels scattered across the park’s plains and terraces, including the 16th century Buddhist icons of Chup Preah, and the little shrine of Sdach Kamlung, uncovered from beneath fossilized lava.